Narrow clumps of gracefully sweeping, silver variegated leaves. The October flowers are a deep red-bronze. The foliage has a pink cast in fall. 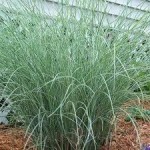 It prefers full sun and a moist soil, but is tolerant of a wide range of soils. Cut the foliage to the ground in late winter before the new shoots appear. 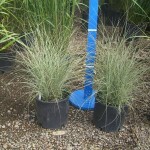 A very versatile grass for the border, mass plantings, or as an accent.